I have finally finished! 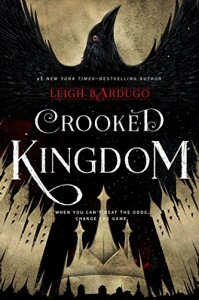 The sequel to Six of Crows and the finale of this duology ends to me with a satisfying conclusion. It has been a wild journey for me, a long one (my fault, due to reading slump and work) and in the end, it's almost perfect. Continued from where it was left off, Kaz Brekker and his crew returns to Ketterdam as wanted fugitives. After being double crossed by Jan Van Eck, the crew needs to hide their most wanted prize, if only they won't be hunted by every one who wants that prize and killing the crew. But Kaz has a plan that will change the game of odds to his favor and the only way to do this, is that his crew able to survive to challenge what's ahead of them. I do love the finale and how it ended. Its not really great but its good enough that it ends as its meant to be. I love the characters, its development and the relationship between one another. The scheming and the planning, the plot and the twist is just good enough to keep me reading. If not for the slump, I would have finished this sooner. There is so much to explore on this book that I want to talk about but this is definitely worth re-reading... one day. 4.5 out of 5 stars.